Thirty-something Midwesterner Mark Fife believes he has successfully moved past the accidental death of his young son, Brendan, as well as his subsequent divorce from his college sweetheart, Chloe. He's successful, he's in love again, and he believes he's mastered his own memories. But then he is contacted by a strange woman who tells him not only that she owns his old house, but that she believes it to be haunted by Brendan's ghost. Will Mark - who does not believe in ghosts - come to accept the mounting evidence that Brendan's is real? Will his engagement to his new love Allison be threatened by the reappearance of Chloe, who does believe? If the ghost is real, what can these two wounded parents do to help their son? 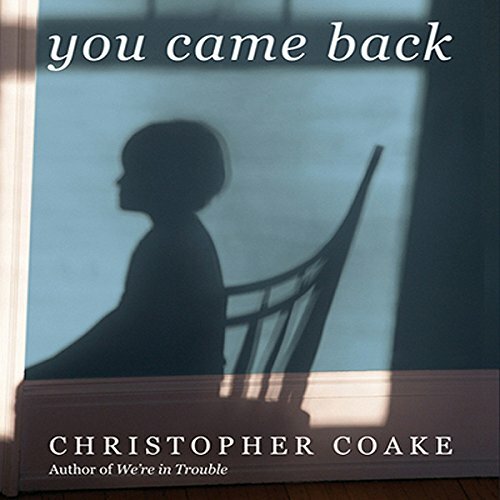 You Came Back examines the beauty and danger of belief in all its forms - not only belief in the supernatural, but in the love that binds parents and children, husbands and wives. Would you listen to You Came Back again? Why? This was a decent story, but somewhat predictable, and I struggled to like the main character. He describes himself as struggling to not be a sissy (not the exact word, but you get the meaning), and throughout the story I kept thinking to myself Yup, he sure is. That made it difficult to connect with him. Several of the other characters were great, and helped to move the story forward, especially his father. Have you listened to any of Scott Holst’s other performances before? How does this one compare? The reading was excellent. I've listened to other stories read by Scott Holst, and they are universally easy to understand and not prone to "over-acting" which is one of the things that drives me crazy about some readers. Scott did a good job of giving subtle differences to the characters voices so you can easily distinguish who is speaking. His pacing is perfect for this story. All in all, it was worth reading, but I won't listen to it again. Excellent job by the reader, Mr. Holst. Would you try another book from Christopher Coake and/or Scott Holst? What was most disappointing about Christopher Coake’s story? The story took a different direction from what I expected and as it unfolded I cared less and less about the characters involved in the tale. I had no issue with the performance by Scot Hoist. It was the story he told. I was surprised I actually finished it.